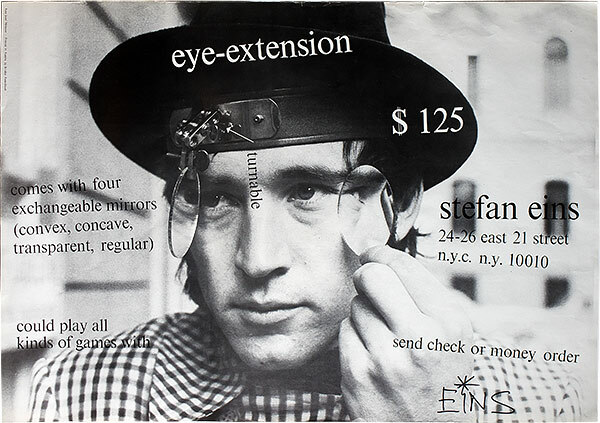 Stefan Eins, Eye-Extension, poster, 1975. Photograph of Eins by Josef Nobauer; printed in Austria by Bruder Rosenbaum; designed and signed by Eins. Offset print, 23 ¼ x 33 in. Poster has a tiny repaired tear that is almost invisible close to the area with the white arrow. Eins models his Eye-Extension, an interactive. wearable artwork with moveable mirrors. 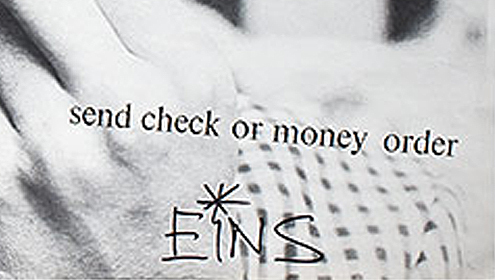 The poster shows Eins’ commitment to direct marketing that led to the establishment of the 3 Mercer Street Store.